This post is sponsored by AirWick. At the end of this post, please be sure to join the conversation for a chance to win a set of four holiday scented candles! Today, I would like to talk about my love affair with candles. In my opinion, they are a very under-rated decorating element. This one small item can instantly enhance the mood of an entire room with a simple swipe of a match. 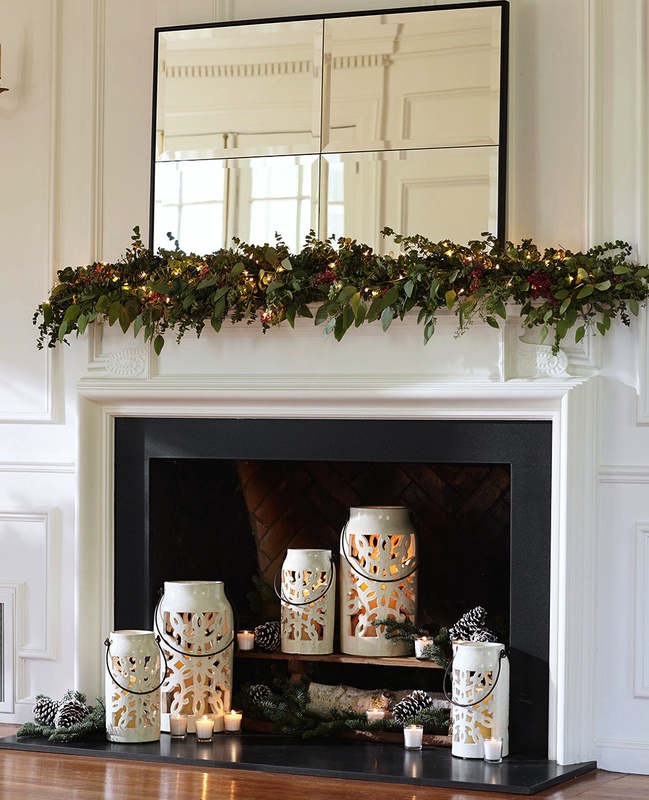 I love to decorate using candles year round, but during the holidays, they are an absolute must-have. 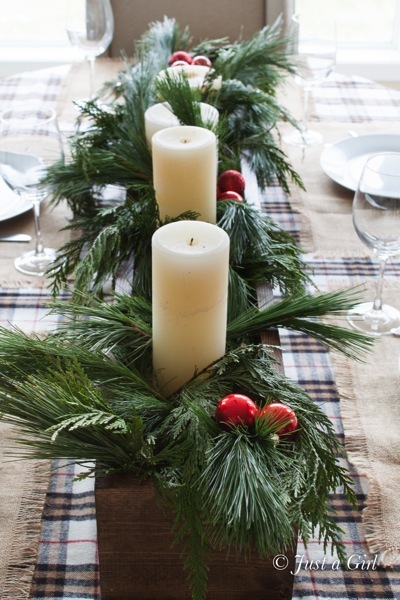 There are so many simple and affordable ways candles can be used to create a festive holiday atmosphere. Even budget friendly candles found at the supermarket can be transformed into elegant, expensive-looking, holiday displays with just a few simple embellishments. Not only do candle displays look pretty, but scented candles can play a big roll in creating a heartwarming holiday feeling by providing the aromas of the season. This example is my Thanksgiving table from a few years ago. I filled a trio of lanterns with fresh coffee beans and placed a vanilla scented candle inside each one. The coffee beans looked really pretty and provided texture to the table top. They also gave off a heavenly scent as they were warmed by the candlelight. This DIY centerpiece by Just A Girl is a simple, but stunning way to create a holiday candle centerpiece that casts a beautiful glow on your table. If you ever wanted to try your hand at a DIY project, click here for a great step-by-step tutorial. Speaking of simple, this tablescape from Best Day Ever couldn't get any easier to assemble, nor could it be any prettier! 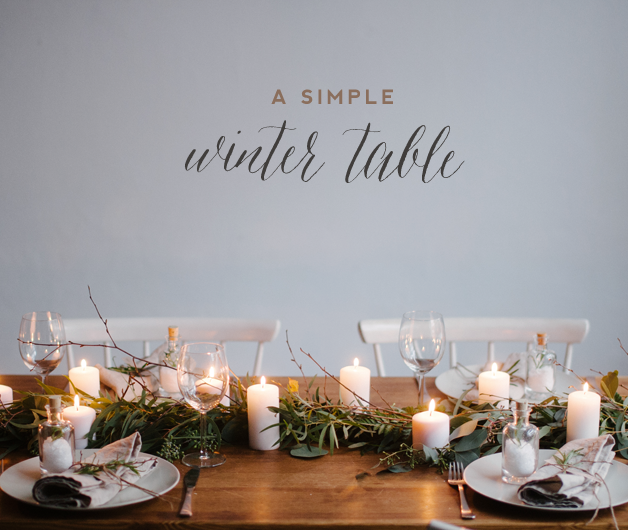 Simply placing fresh greens and twigs along the center of the table and topping them with pretty, white candles creates an incredible winter table scape. Click here for more fabulous images of this holiday candle display. 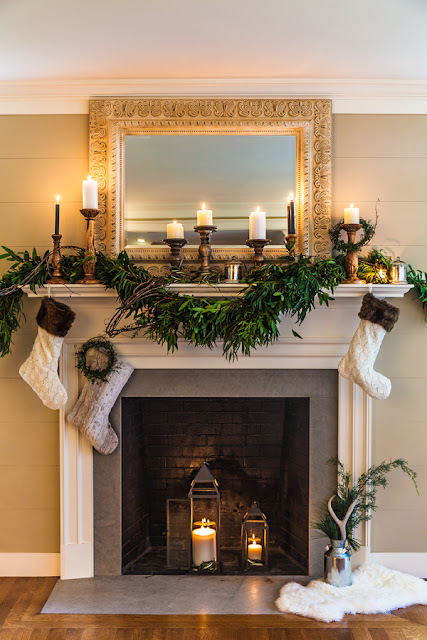 If you ask me, there is nothing better than having a beautiful fireplace to cozy up to during the holidays. This gorgeous holiday fireplace is all aglow thanks to a collection of candles on top of the mantle and along the hearth. I may never want to leave if I visited this home for the holidays. More details on this mantle can be found here. This image from Potterybarn grabbed my attention right away thanks to the beautiful oversized candle holders and small votives grouped together inside the fireplace. Occasionally I fall in love with the scent of a candle, yet the color may not be right for the area I am using it in. A pretty candle holder allows you to incorporate a warm candlelight glow in any scent you wish, regardless of the color of the candle. Such as the Emerald Woodlands candle by Airwick. It is a fabulous holiday scent and the green color looks great in most areas of my home, however, if I wanted to use it in our bedroom where green isn't an accent color, having a pretty holder to place it in gives me total freedom to use it there. This image is of the shelves in our powder room located in the main level of our home. This is the rest room that our guests use during holiday parties, having a pretty scented candle for this space is a seasonal must-have. A lit candle placed in the areas used by our guests provides a warm, welcoming atmosphere as well as provides a fresh scent. 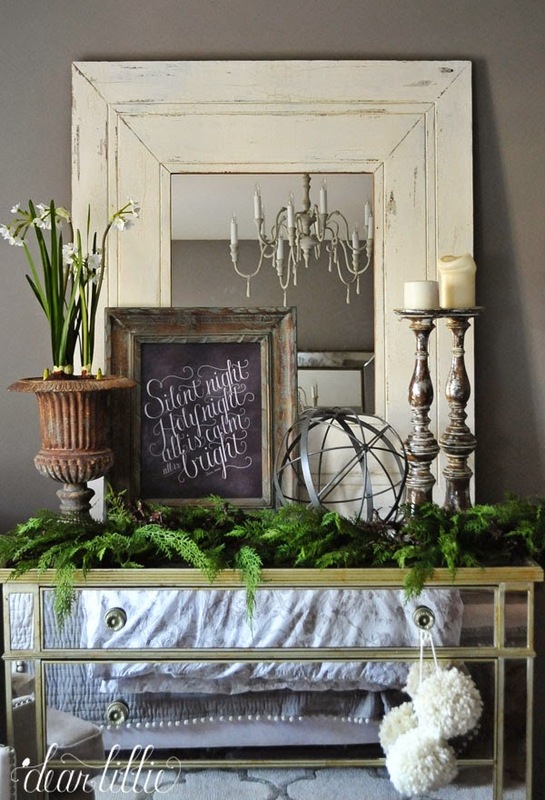 If you follow decor blogs then you are sure to have visited Dear Lillie. Her Guest Room always looks cozy and welcoming. During the holidays it is especially beautiful. As you can see in this vignette on her dresser, this space always features fresh florals and candles for her guests to enjoy. Yep, pretty sure I would be overstaying my welcome if I visited her home. Why stop at using candles to welcome your guests inside your home? 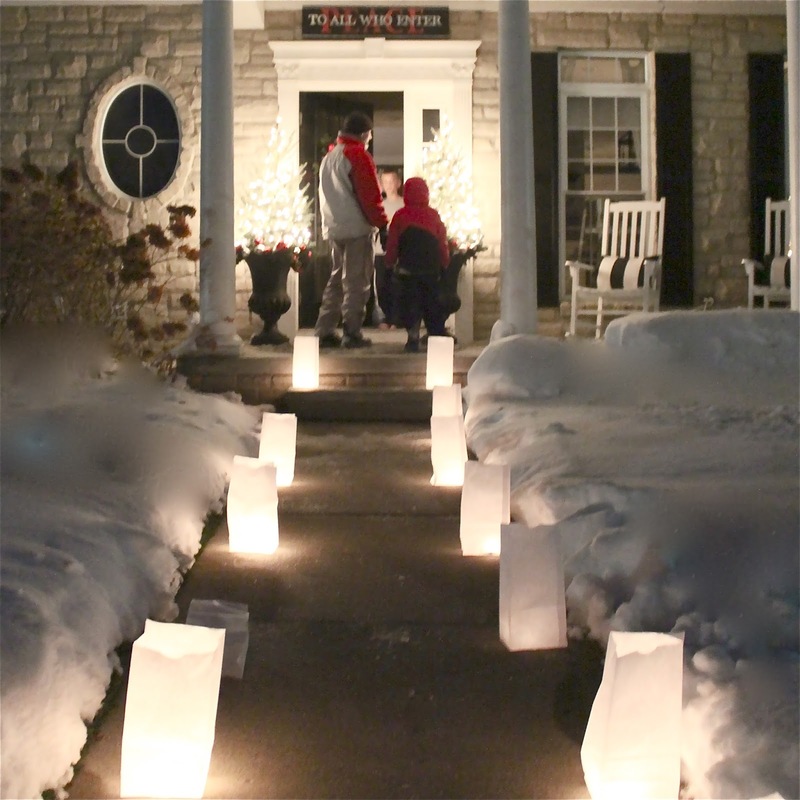 These candle lit luminaries lining the walkway to our front door the other night drew our neighbors over for a visit. I was lucky enough to be across the street with my camera just in time to grab this picture of the visitors that were lured to our home by the candle lit path. This project was so easy to do, I filled white paper bags with play sand and placed a candle in each bag. Voila! This large urn featuring holiday greens and an oversized lantern filled with candles is a show stopping way to decorate the front porch. I think this is my favorite Christmas planter EVER (image found here). I have always wanted to place a collection of candles on the staircase during the holidays and my children are almost to an age where I feel safe doing so. This candle display featured by Coastal Living is just too pretty. I can only imagine how it looks at night! To make it a little easier for one lucky reader to incorporate candles in his/her holiday decor this year, I'm giving away four delicious smelling candles from Airwick (2 Apple Crumble and 2 Emerald Woodland). All you need to do to enter for a chance to win is share your favorite ways to incorporate candles into your home during the holidays in the comments below. Please be sure to include your email address so we can contact the winner! This giveaway is open to US Residents age 18 or older (or nineteen (19) years of age or older in Alabama and Nebraska). Winners will be selected via random draw, and will be notified by e-mail. You will have 2 business days to respond; otherwise a new winner will be selected. My favorite way to incorporate candles during the holidays is by placing them in lanterns and mason jars. 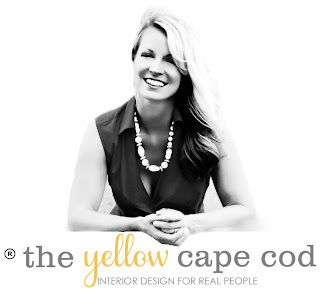 Hello, the yellow cape cod. I have been following your blog for years! I hope my blog can be successful like yours one day! You definitely are an inspiration. Thank you! I love decorating with candles. I'm hosting a wedding reception at my home in January and I got a lot of ideas from the pictures of the mantles. Thanks for the great ideas and I always love the picture of your red accessories in the bathroom. I love to decorate with candles. I love that magical glow! They are everywhere in my home. Powder room, sconces in hallway, table tops, bathroom, kitchen. But for me, it's also about the scent. 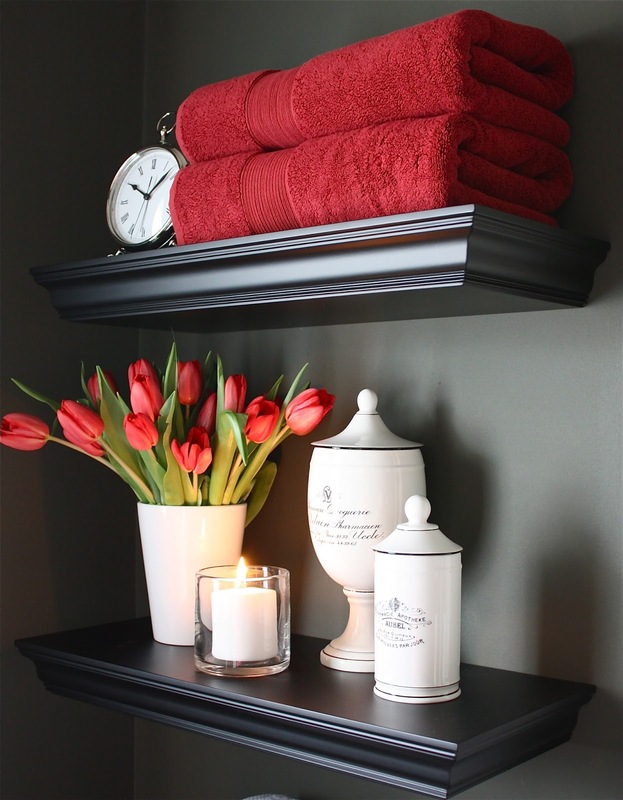 I have dogs and sometimes it's a must ;) Any chance I can ask where you got your floating shelves in your powder room? I love your style! Thank you, Colleen! They are from Potterybarn. I love having candles all over the house. I like them in lovely glass holders in colors that accent the rooms. I love putting candles in my entryway and bathrooms! I like to set out candles in a trio display of complementary scents and colors. I love to display candles on top of our fireplace, kitchen counters and table. We love burning candles, especially around the holidays!